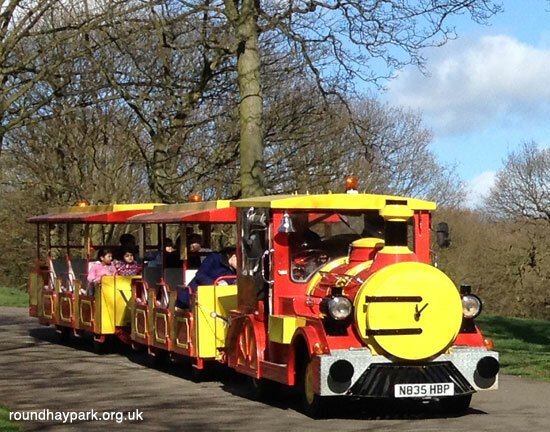 Roundhay Park Train - take a ride through the park. The Train will be running on weekends throughout the Summer, and during the school holiday. Roundhay Train - prices and fares. The Roundhay Park Land Train. Once again the Roundhay Park train ride is available through the park. All aboard at either stop for £1.50 one way or a return ticket for £2.00 (prices April 2017). The journey is approximately 8 minutes each way. Panoramic view of the Lakeside Cafe and Waterloo Lake at Roundhay Park. The route runs from the Lakeside Café, past Barrans Fountain, with the Arena on your left then towards the Mansion with some of the Victorian Shelters visible on your right as you catch a view of the Upper Lake and then turn past the Mansion to the Park Gates.